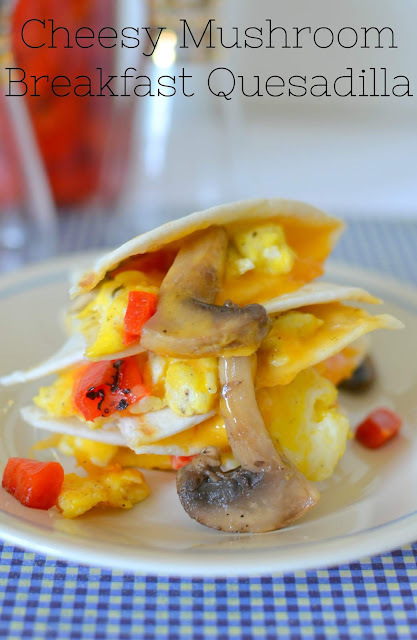 These delicious mushroom quesadillas are packed with scrambled eggs, roasted red peppers and shredded cheddar cheese! Such a great way to start the day! Breakfast is my absolute favorite meal. Ever. The majority of the time when I eat breakfast, it's usually for lunch or dinner. During the week I'm too busy to eat much more than cereal. Don't judge! I love me some Cinnamon Life or Frosted Mini Wheats and it gets me out the door on time. On Saturdays and Sundays, I'm busy sleeping in or hitting up the local Farmer's Market in the AM. I had some great finds at the market this weekend including some oyster mushrooms and fresh tomatoes! I've already made guacamole, salads and BLT's with the tomatoes and will be creating something fabulous with the oyster mushrooms tomorrow! 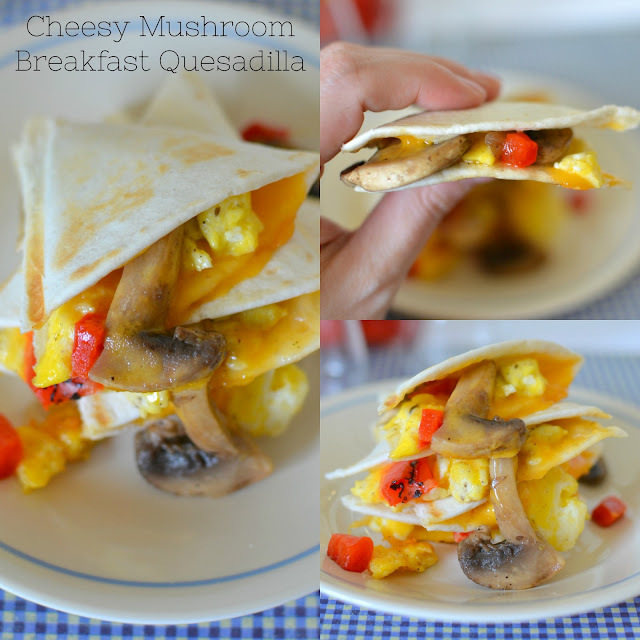 These Cheesy Mushroom Breakfast Quesadillas ended up being lunch last weekend. 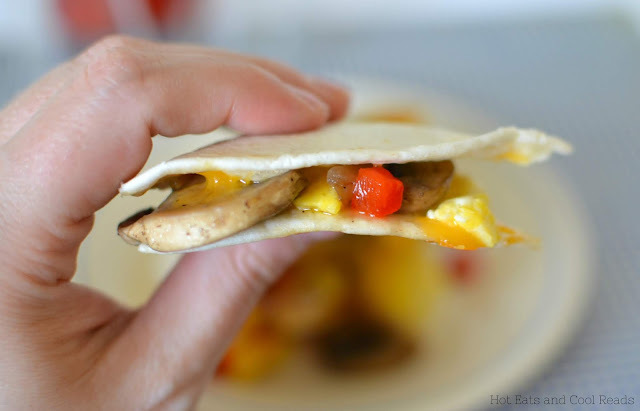 I found a few ingredients that needed to be used from the fridge, threw them in the quesadilla maker between some tortillas and the final result is some amazing cheesy goodness! Instead of adding the meat to the quesadilla, I served some fried ham on the side. These would also be great with any breakfast sausage or bacon. Also try using different varieties of mushrooms like the oyster mushrooms mentioned above. I saute large batches of mushrooms at a time, then refrigerate the leftovers to add to meals through the week. It's a huge timesaver and they add so much flavor to any meal! I chose not to use any sauce when I ate my quesadillas, but they would be great served with a seasoned sour cream, taco sauce or salsa. I'm not much for sauces and I enjoyed them exactly as pictured! There's some things you just gotta be selfish with! Check out my newly updated recipe for Salmon Pesto Cream Tortellini! In a skillet, heat the olive oil on medium high heat. Add mushrooms and a pinch of salt and pepper and saute for 5 minutes. Transfer to a plate. Wipe the pan clean, add butter and heat to medium. Add the eggs, a pinch of salt and pepper and scramble. 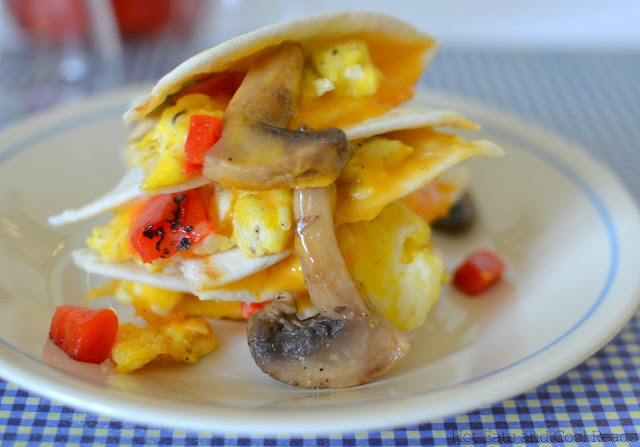 Layer the mushrooms, eggs, peppers and cheese on three tortillas and cover with remaining tortillas, pressing gently. 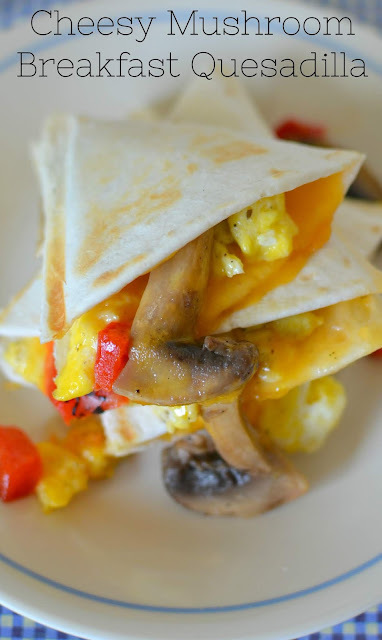 Place quesadilla in a quesadilla maker or skillet and cook until golden brown on each side, about 3-4 minutes. Cut and serve!